My Field Guides books are already installed at Lake Roland Park’s for their Art on the Trail program, but I wanted to be sure to write about the third book I made “The Secret Language of Trees”. 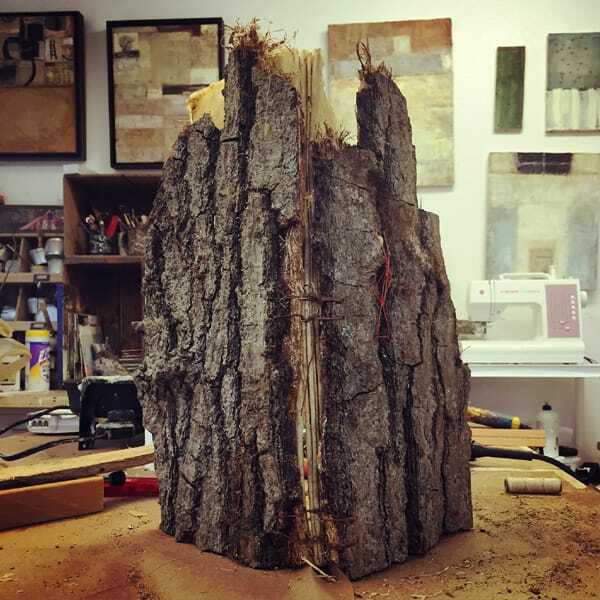 In my proposal I wrote that I would make a book made out of bark. For my show this past July I had made two little paintings that I thought I wanted to revisit, but in a large size and in a book format. That was the plan until one afternoon I found myself on a nearby land that was clearing out trees for a new building. With the owner’s blessing, I was given permission to take anything I wanted. As a lover of trees I felt so sad to walk among the felled trees. I came across big pieces of bark that were so beautiful and I started to gather these pieces. They were extremely heavy, but somehow I managed to get them to my car. I didn’t know what I was going to do with them, but I knew I would do something to give these trees an homage of sorts. I share the above moment of coming across the bark because it gives a glimpse into my creative process. When I am working with natural materials, I often work in response to the materials. I may have a plan, but I always know that the plan is just a plan and it will change once my hands get on the materials. Once I hold things and handle them, then the materials in a sense tell me what should be done. 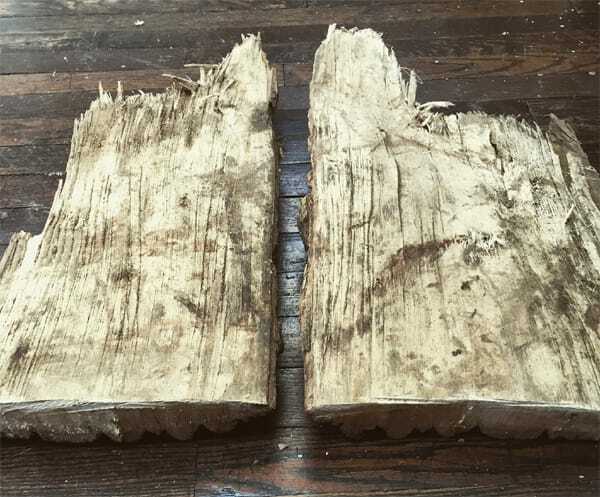 I took the largest and heaviest piece and sawed it in half using a handsaw. That was so much more difficult than I thought it would be! But it was this piece of wood that spoke to me and told me what needed to be done. I used the coptic stitch to bind the pages into two other pieces of bark that I also sawed. These pieces are smaller than the one in the photo at the top. 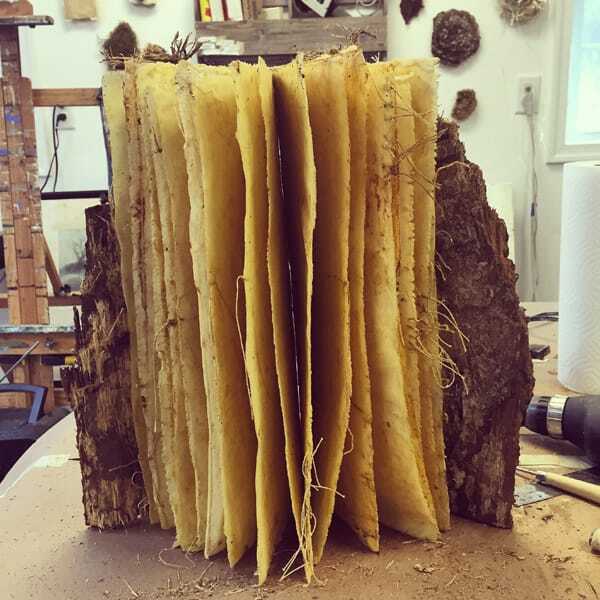 The pages are made out of cloth dipped in local pure beeswax. A local beekeeper gifted me a big block of his golden wax- a precious gift! However because the wax is so yellow, I prefer not to paint with it. 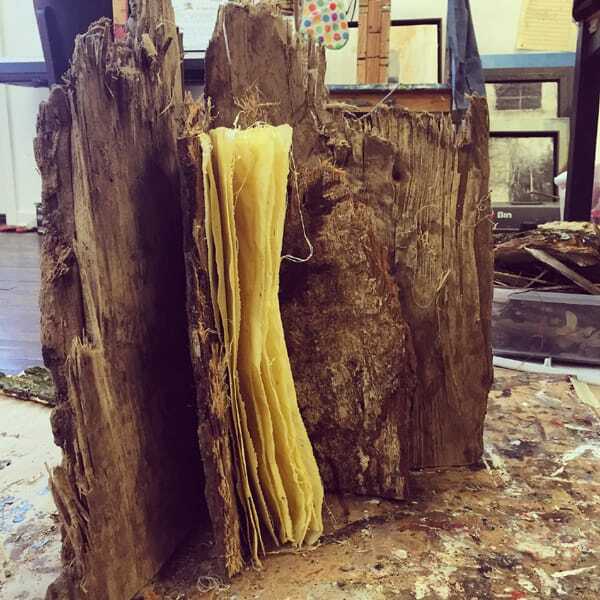 This use of the pure beeswax was perfect- it created golden pages that seem to glow when the light filters through the surface. The beeswax though is not about decoration. It is about preservation. My pages need to be able to withstand the outdoor wintry and wet elements. There is no damar resin added to the wax either as I need the pages to stay pliable. 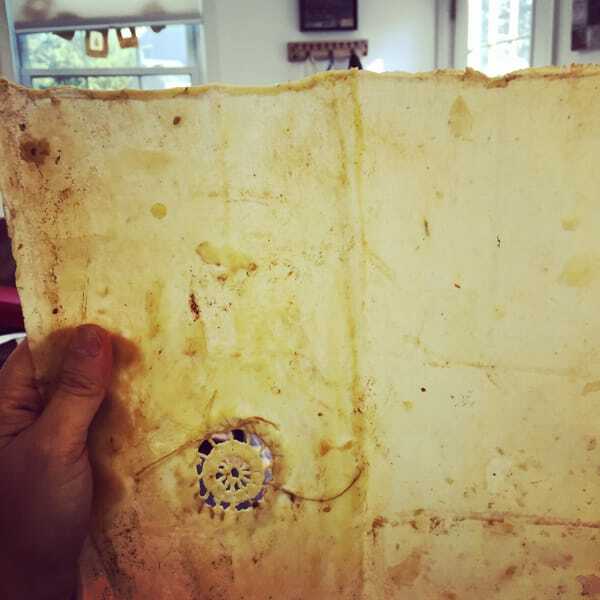 Pure beautiful golden beeswax that will the protect the pages as best as it can. I stitched the pages, as again I want the pages to be investigated and “read”. One of the things I learned in my research is that within a single tree there is so much going on. So much living and so much life. I already knew that, but delving into the details was illuminating. Trees can tell us so much, if only we know how to read them. For instance, we all know that a tree’s rings can tell us how old a tree is. But it can also tell us if there was a drought 150 years ago. Or if there was a fire or a season of plentiful rain. The interesting thing too is that of course weather often is linked to historical events- many of the important revolutions in human history occur in the middle of summer- when it’s hot, and/or when there has been a disruption in agriculture- and people are hot and hungry and fed up. Trees can speak to these correlations. Something to think about! They are the record keepers for us. Isn’t the bark just beautiful? 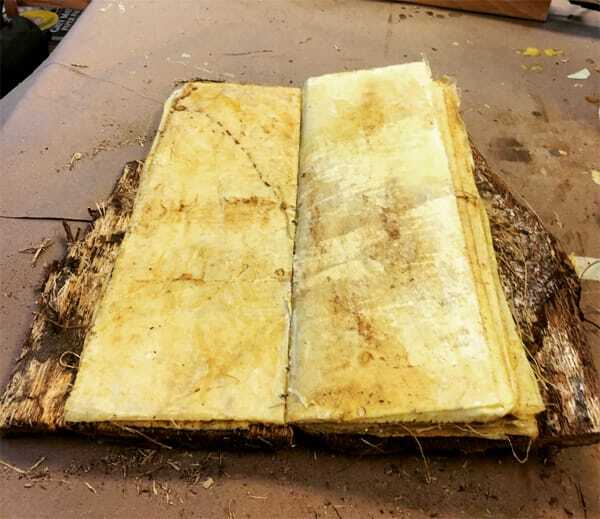 I wish I had the knowledge to positively identify the trees, but if I had to guess- the inner book is probably from an oak and the outer book cover is from a black walnut tree. But as I only have the bark and did not see where the tree came from to see leaves or twigs, I am not totally sure. I wish I knew! One thing that has always fascinated me is how every culture has a sacred tree reference in their origin stories. Humans have always been drawn to trees and have recognized their importance- until our modern age it seems. Trees are sanctuaries. Whoever knows how to speak to them, whoever knows how to listen to them, can learn the truth. The do not preach learning and precepts, they preach, undeterred by particulars, the ancient law of life. A longing to wander tears my heart when I hear trees rustling in the wind at evening. If one listens to them silently for a long time, this longing reveals its kernel, its meaning. It is not so much a matter of escaping from one’ suffering, though it may seem to be so. It is a longing for home, for a memory of the mother, for new metaphors for life. It leads home. Every path leads homeward, every step is birth, every step is death, every grave is mother. So the tree rustles in the evening, when we stand uneasy before our own childish thoughts. Trees have long thought, long-breathing and restful, just as they have longer lives that ours. The are wiser than we are, as long as we do not listen to them. But when we have learned how to listen to trees, then the brevity and the quickness and the childlike hastiness of our thoughts achieve and incomparable joy. Whoever has leaned how to listen to trees no longer wants to be a tree. He wants to be nothing except what he is. That is home. That is happiness. I SO wish I could see this. It just looks wonderful. A beautiful book, the pages are exquisite - the light shining amber through them! How I wish I could see it on the trail! Love this, Bridgette! Regular books on the library shelves might be produced, at least partially, by trees, but I far prefer this one! Nothing contrived or artificial or manufactured about it! What a lovely tribute to the majestic tree that was used to make it! Can't wait for my hike of treasures! You outdid yourself with this one Bri. Wish I could be on the trail so I could discover your books. Bridgette, I met you on the Lake Roland trail yesterday. (I was with the little kid who was afraid of dogs and even kittens.) Your work is so beautiful. I was completely enchanted by your book installation. I still wish I could have that golden bark book in my house! I hope you'll put me on your mailing list, as I'd love to come to any art openings you have. Cheers! Doh -- sorry, Bridgette -- I just realized you probably have no idea what I was talking about. It was your sister with whom I was chatting, further on up the trail, telling her about the little kid afraid of animals as I was petting her beautiful dog. When I mentioned that the book installation was my favorite, she said that you had done it. Then I ran into you and you told me about the encaustic process, and the fact that your installation had withstood the deluge of a few weeks ago. Anyway, lovely work. I felt like I was walking in a sacred grove. I figured out what you were talking about Lisa! :) Thanks so much for coming out to walk the trail and for your very kind words. I appreciate it! I hope the kids had fun...or at least enjoyed the warm weather out yesterday!